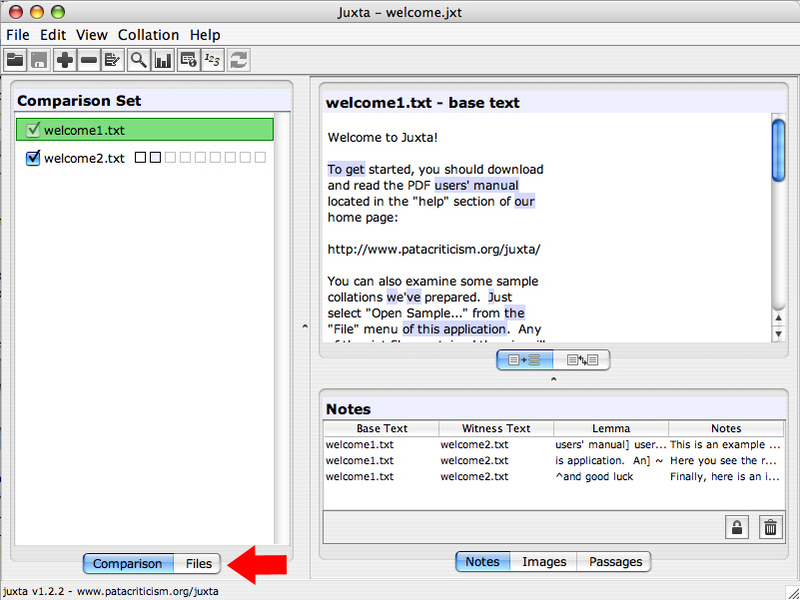 Juxta 1.2.2 is now available for download. The major new feature in this release is an improved fragment selection mechanism and the ability to easily preview files before collating them. This functionality is accessed via the “Files” tab on the left hand panel, depicted below. Clicking on the “Files” tab brings up a tree of the files in the currently selected base directory. Clicking on the file icon allows the scholar to select a directory from which to select files for collation. Double clicking on files with a “txt” or “xml” extension opens them in a preview mode. The scholar can then choose to import the entire file into the collation or to highlight a fragment and pull just the highlighted fragment into the collation. Fragments carry with them the metadata and lineation from the source text, if any. This new functionality replaces the old fragment selection mode with a more integrated solution.